Hi, I'm Jordan Miller. 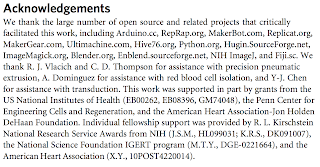 We have just published our peer-reviewed scientific study utilizing RepRap to make 3D sugar templates for making vascular tissues for research in regenerative medicine (for educational or non-profit use you can email me at UPenn to get a copy of this paper). 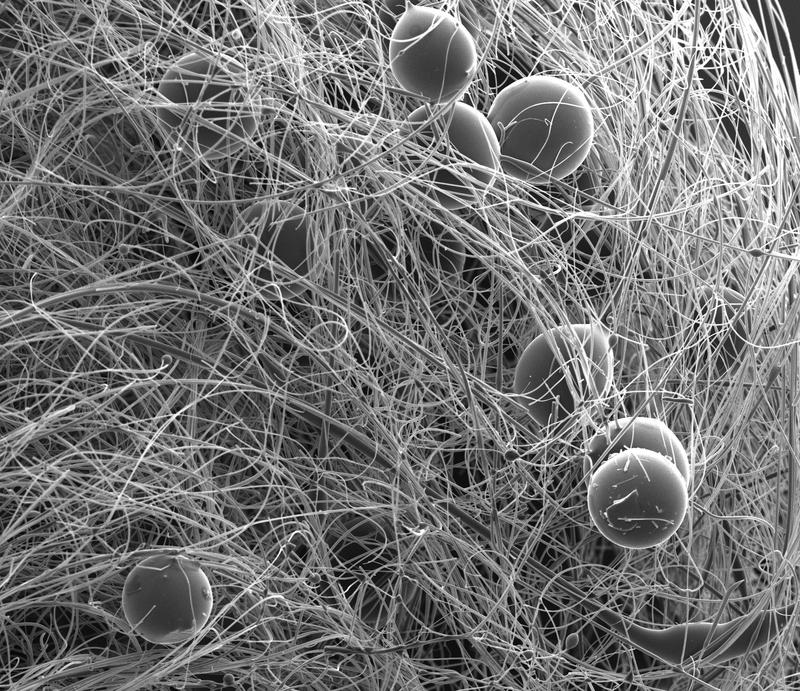 While scientists can grow literally billions of cells in flat-bottomed petri dishes, the big challenge in creating large-scale engineered solid tissues is how to properly deliver nutrients and oxygen to all of the cells -- when you put a bunch of cells together in 3D the cells inside your structure can't get enough nutrients and oxygen because the cells on the outside take it up first. But how did this come to pass? What was our experimental route to this exciting development? In graduate school I had a friend that was working on electrospinning and taught me how to do it (thanks Quynh! ), and while visiting a Body Worlds exhibit I realized structures reminiscent of vascular networks could be fabricated in the lab and then perhaps used as templates for rapid casting of vascular networks. 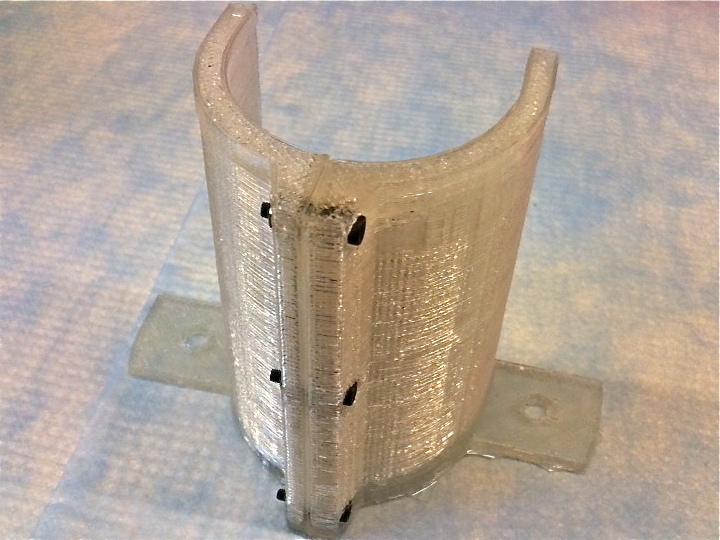 The challenge was to find a material that was structurally stable but that could still dissolve in the presence of living cells (ABS and PLA for example can be dissolved but require harsh organic solvents that are toxic to cells). As you can see, while melt-spun sugar looks cool and is easy to make the sugar network is completely disordered and uncontrollable (though it does follow regular patterns). It looks more like a random capillary network, not a multiscale vascular architecture that represents natural human vasculature. You can easily cast this into a rubber or plastic material and then dissolve the sugar away, but it left me unsatisfied with future prospects for investigating structure-function relationships between vascular architecture and living cells (besides being difficult to keep stable in aqueous solutions owing to its unstable glassy state and high surface area to volume ratio). To truly get at the question of vascularization in a biologic setting, I needed to learn 3D printing. So, in 2008 I joined the RepRap community and learned everything I could about MakerBot and RepRap. Sugars are an ideal material for this application from a cell's perspective, but their ability to dissolve easily is directly related to their hygroscopic character (how quickly they imbibe moisture from the air), which could destabilize the structures I wanted to print. So I realized I needed a way to keep the sugar dry, and developed the heated build platform which was originally made out of nichrome in silicone (and big thanks to Eberhard Rensch for figuring out the firmware on Gen3 Electronics to support a second heater). This design was adopted by MakerBot as the first heated build platform. 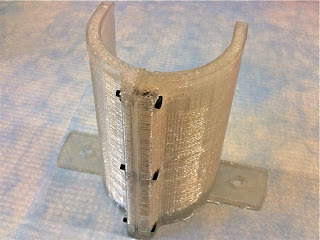 Sugar has another difficult property when compared to extrudable materials like ABS and PLA... it is very brittle. This, combined with its hygroscopic properties described above, meant the prospect of making a 3 mm filament of sugar for feeding into a reprap extruder was really not feasible. After learning the "Idea-to-Object" paradigm forwarded by the RepRap community, I realized a glue gun with computer control might be just the ticket to get this to work. After mounting a linear rail rigged up to Generation3 Electronics to drive a piston into a glue gun outfitted with a trusty MakerBot MK3 nozzle, 3D printing sugar worked on a prototype of our mass-produced Heated Build Platform! But a big problem here is that although the extrusion can be started with high precision, it can't be stopped with high precision. Enter MakerBot's Frostruder design, which uses air pressure to drive. So instead of going from solid sugar sticks to liquid in the tip of a glue gun, I realized a heated frostruder was all that would be needed. Introducing the baricUDA Extruder. Introducing the BaricUDA Extruder for 3D Printing Sugar (and Chocolate!). Derived from the venerable MakerBot MK2 Frostruder, this air-pressure driven extruder ("baric") is a *U*niversal extruder because it adds a *D*egree *A*mplifier (yep... temperature) to let you extrude anything. And baricuda just sounds cool since it's so damn fast (like its namesake). Thanks to Arduino.cc, RepRap.org, MakerBot.org, Replicat.org, MakerGear.com, Ultimachine.com, Hive76.org, Python.org, Hugin.SourceForge.net, ImageMagick.org, Blender.org, Enblend.sourceforge.net, NIH ImageJ, and Fiji.sc! Fantastic work Jordan, congrats on the first author nature paper! That really is most impressive. Brilliant stuff. thanks Adrian! That means a lot. 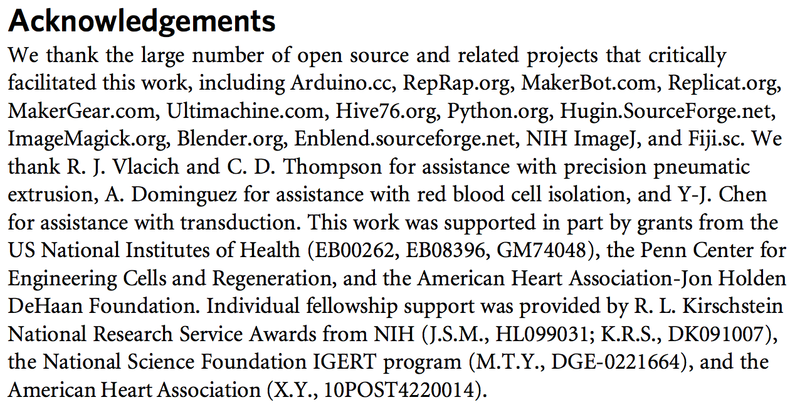 Thanks for RepRap and all you do for RepRap! 1. 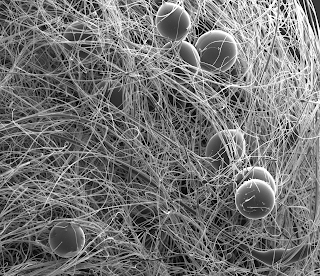 Could you use a similar technique to 3D print growth media, essentially creating a sort of 3D petri dish? 2. While you're printing a 3D scaffold, could you perhaps embed various growth factors in the scaffold, to direct the cell growth and cell differentiation? Potentially it should be possible to have different growth factors in different parts of the scaffold. 3. A simpler version of #2 - instead of printing a single vascular network, print multiple separate but adjacent networks, so that you could deliver different nutrients and growth factors to different parts of the growing tissue/organ.